Mumbai (Metro Rail News): The consortium of Mumbai Monorail operators, namely L&T and Scomi Engineering (LTSE) has alleged that the Mumbai Metropolitan Region Development Authority (MMRDA) does not have the expertise over monorail technology to operate it. 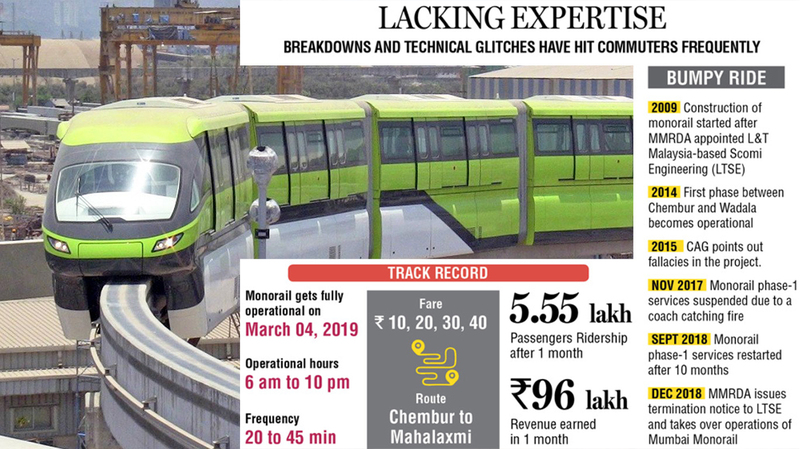 L&T and Scomi Engineering (LTSE), whose contract was terminated by MMRDA in December 2018 alleged that by terminating their contract and taking over commercial operations of Mumbai Monorail, MMRDA has put the safety of the public and the overall system at high risk. stated in the email written to MMRDA by the senior LTSE official. Although, Mr. Murthy, Chief Operating Officer (COO) of Mumbai Monorail at MMRDA told, “They must have drafted, I don’t remember seeing such letter.” However, MMRDA did not deny receiving the same. The MMRDA on December 14, 2018, had terminated the contract of LTSE citing non-performance. However, LTSE in a December 28, 2018, communication to MMRDA claimed that MMRDA’s decision may derail the commercial operations of the second phase between Wadala and Mahalaxmi since the authority does not have technical expertise. The MMRDA while terminating the contract had cited a host of issues, including ‘persistently disregarding instructions’, failure to start the second phase and failure to supply the balance five trains. Currently, 10 trains are in India of which only four are functional. The second phase of monorail got operational on March 4, 2019 while the first phase between Chembur and Wadala was operational in February 2014. The latter was in news for frequent breakdowns and technical glitches. The consortium has claimed that the amount of around Rs 1,800 crore under dispute that has been denied by MMRDA has actually impacted the financial capability of contractor LTSE to infuse funds on its own to make the system functional.